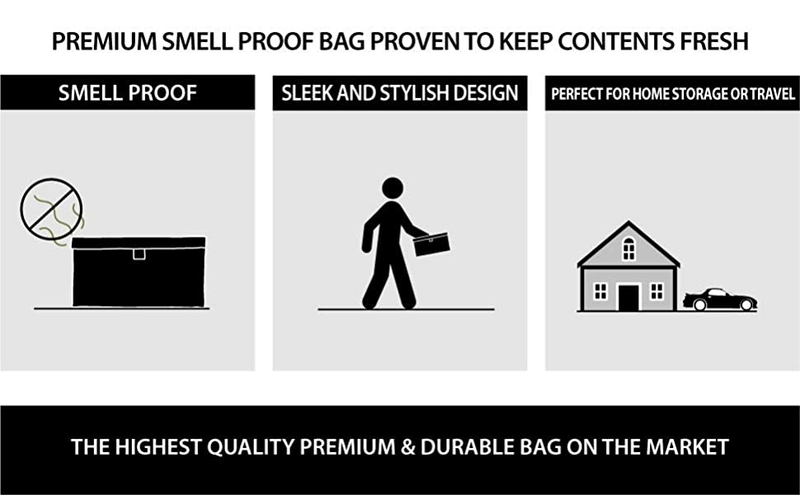 100% SMELL PROOF BAG THAT LOCKS IN ALL SCENTS & ODORS - Have full confidence knowing the Herb Guard Bag contains all smells while keeping your goods fresh! A PATENTED BAG WITH A BUILT-IN COMBINATION LOCK TO KEEP CONTENTS PRIVATE & SAFE - This patented bag contains a built in combo lock allowing you to set your own password combination and protect your goods. STORES 3 TO 4 OUNCES OF YOUR FAVORITE GOODS - Keep your goods fresh and safe without worry! This bag holds roughly 3 to 4 ounces of your favorite herbs, dried foods and consumable goods. Large 12x10 Inch Pouch Holds 3 Ounces of Your Favorite Goods The Herb Guard Smell Proof Bag is a compact 11 inch by 6 inch bag that holds all of your favorite goods with complete smell proof protection. A discreet and stylish bag, designed with you in mind. Each bag has a double velcro seal and smell proof carbon lining that traps and eliminates all scents and smells. With a tough and durable exterior, the Herb Guard bag is moisture and tear resistant while protecting your coffee, teas, dried foods, herbs and spices. The bag contains an inner mesh divider to keep your items organized inside the bag, as well as a mesh pocket on the front of the bag to store all of your goods and accessories without having to lock them. This zipper protected pocket allows for quick and easy access to all of your contents. If you're looking to store and keep your consumable goods separate from your other items, look no further. The Herb Guard pouch comes with 2 large, reusable travel bags to store any consumable goods you have and keep them separate from your other accessories and items in the bag. Now each pouch is equipped with double smell proof protection! How does the bag keep contents smell proof? The bag contains an activated carbon lining with tiny pockets that trap and eliminate even the strongest smells. No matter what you store inside the scent will be gone. Does the bag remain smell proof? How long does do the smell proof properties last? The bag remains smell proof for many months and even years. If it does being to release smell, put it in the dryer or take a hair dryer to the inside of it on light heat to reactivate the carbon lining. The packaging is simple and discreet. It is shipped in a plain box with the bag inside.